When David Christian meets people who claim to be “ancient” historians he must chortle inwardly. As Christian has developed a new educational course that encompasses the entire history of our universe – all 13.82 billion years of it. A timeline of our universe. Source. In a recent seminar Christian talked about the importance as well as the contents of a new syllabus he is aiming to introduce to high schools. In the 1980’s Christian began to wonder why historians traditionally do not look back past human history. He reasoned that a more expansive study of history would help humans to gain a perspective on, and a sense of belonging to, something bigger than themselves. Christian also strongly agrees with C.P. Snow who, over 50 years ago, said that there was a lack of communication between science, the humanities and the general public. From these thoughts Big History was born. As Big History covers all known history up until the modern day, it is very interdisciplinary. When the course was first taught at Macquarie University in 1989 Christian said he would often bring in specialist lecturers to talk about cosmology, chemistry, evolution or biology in greater depth. After being a student to these lectures for a decade, Christian began to give some of the lectures himself. This was not necessarily out of choice for him, rather the specialist lecturer was not able able to attend. As Christian delivered more and more of the content the course developed a natural flow through the content, which is perhaps now the biggest strength of the course. It was this connectivity between fields that prompted Bill Gates to contact Christian about 10 years ago. Gates had taken the course and was keen to develop Big History into a subject that could be taught in high schools. In 2011 some schools in the US and Australia began running Big History courses. Today over 300 US and 100 Australian schools have Big History included in their curriculum. The Big History course is divided into eight compartments which have been called thresholds (See figure below). The 8 thresholds of the Big History course. Source. Each threshold represents a significant advancement in in the history of our universe. These thresholds are very anthropocentric. That is, these are the stages that needed to occur for human society to exist as it does today. When learning about this progression of events you begin to realise just how special our planet and our species are. In the beginning of the course, which typically runs over a 13 week period, you learn about the Big Bang and the subsequent influence of gravity and dark matter in creating stars. With stars it became possible for new elements to be formed. Before stars only the first four elements of the periodic table existed; over 99% of which was hydrogen and helium. With young stars, elements up to iron (no. 26) could be formed via the fusion of smaller elements. Super massive stars can then go supernova, making it possible for the other elements to be formed. As you can see from the diagrams below the formation of stars and supernovas was necessary to form the Earth as well as the human body. 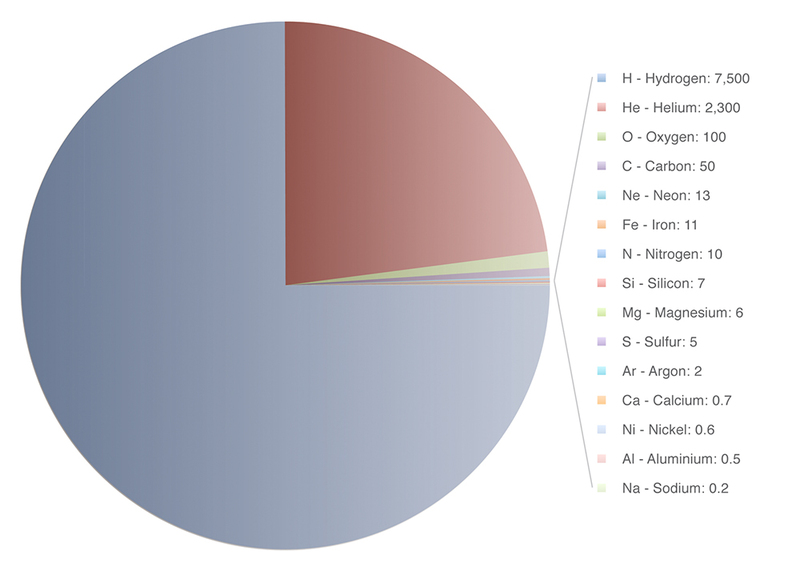 The elemental composition of the universe. Source. 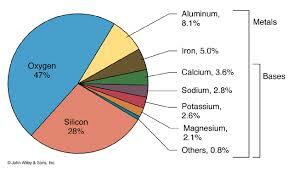 The elemental composition of the Earth. Source. 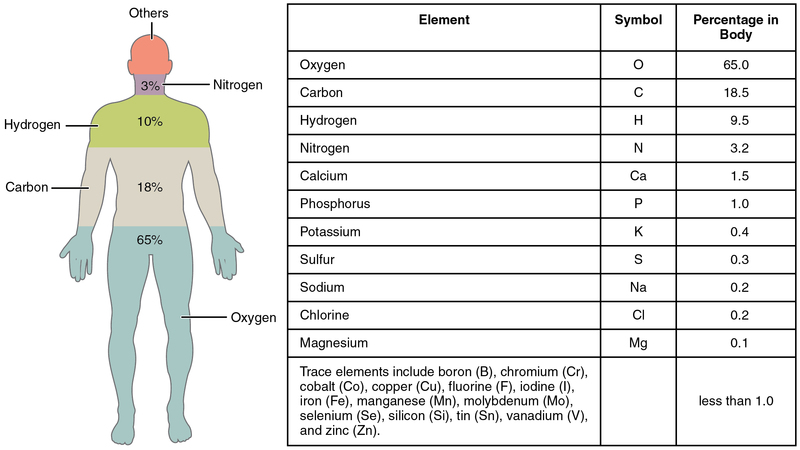 The elemental composition of the human body. Source. That’s right! We are all stars…literally. After stars facilitated the formation of solar systems, which is the next threshold (no. 4), the conditions on Earth were such that life could exist. This means that the Earth was in the “Goldilocks” zone. The Goldilocks zones are the regions of the universe were conditions are suitable for life – juuuuust right. The beginning of life on Earth, 3.5-3.8 billion years ago, is threshold five of the course. As a biologist I feel there could have been another threshold or two during the development of life, such as multicellularity or the Cambrian explosion. Much as a physicist would probably say there should be more thresholds for the formation of the universe. But in the interest of simplicity these are not major thresholds for the course. The next threshold is the ability of species within the homo genus to learn collectively. This means that communication had developed to a level of sophistication that allowed inter-generational knowledge accumulation. And so, the tools improved over hundreds of thousands of years until eventually humans had asserted themselves as the dominant species on Earth, after colonising the vast majority of landmasses. The next threshold was agriculture at the end of the pleistocene (10000 years ago), which allowed population centers to generate a surplus of food. The final threshold brings us to the modern era – the burning of fossil fuels. The burning of fossil fuels allowed us to generate vast amounts of energy that had been stored 300 million years ago. It has been estimated that due to fossil fuels humans now control a density of energy that is one million times greater than the sun. In regards to this energy, Christian said, ” I don’t think we’re really in charge of this huge machine we are driving”. He said this level of energy may be the undoing of civilisation, through climate change or other phenomena. The full course of Big History is available free online here. This is a video from the era of C.P. Snow about the issues of communicating with scientists, and of being scientifically literate. David Christian hopes to bridge the gap in communication between scientists and the community through big history. Note: I have been writing “our” universe throughout this piece as there are a growing number of scientists who believe multiple universes (multiverse) may exist. David Christian earned his BA at Oxford University, his MA at Ontario University and by 1975 had completed his PhD at Oxford. His PhD was on 19th century Russian, and the influence of vodka on the Russian peasantry. He taught at Macquarie University from 1975 to 2000 and in that time developed his course called Big History. In 2001 he moved to San Diego University, but returned to Macquarie in 2009. In his time in America he was contacted by Bill Gates about Big History, and the Big History Project resulted. Since 2009 he has been teaching various course at Macquarie, and recieved a distinguished lecturer award in 2013. He has also authored a book “Maps of Time”. Davies, P. 2008. The Goldilocks Enigma: Why is the universe just right for life? Houghton Miffin Harcourt. Christian, D. 1991. The Case for “Big History”. Journal of World History, 2: 223-238. Richerson, P.J., Boyd, R. & Bettinger, R., L. 2001. Was Agriculture impossible during the Pleistocene but mandatory during the Holocene? A climate change hypothesis. Journal of Would History. 66: 387-411.